Does the Longmont City Council think gun safety is “scary”? It seems so! On Sept 11th, Longmont Mayor Brian Bagley backed out of reading an approved “Firearms Awareness and Safety Day” proclamation after Mayor Pro-Tem, Polly Christiansen, threatened to walk out calling the proclamation deceitful. Well, we’re here to let them know gun safety isn’t SCARY! 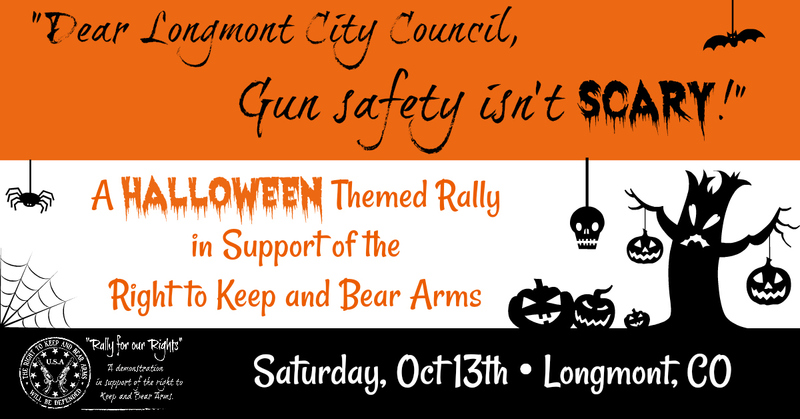 Join Rally for our Rights in this Halloween themed demonstration in support of the right to keep and bear arms. Saturday October 13th – 1 to 3pm – intersection of 6th and Main Street on the west side of Main in Longmont, CO. To go along with the Halloween theme, feel free to come dressed in your best Halloween costume (please don’t wear a mask). And as always, don’t forget the signs! Get creative! We will be doing a Coat Drive for the Longmont OUR Center. Bring kids and adult coats of all sizes (snow pants and other winter items are also needed) or cash donations. If you would like to donate something other than a coat, you can find their needs and donate directly here: www.ourcenter.org/donate-items. We’ll also have a voter registration table set up where you can register to vote or get instructions about how to check to make sure your voter registration is up to date, and details about where and how to vote. This will be a non-permitted event exercising our First Amendment right to protest on public sidewalks. There will be no speakers or set agenda. We will be lining the west side of Main Street carrying signs, banners, and flags supporting our right to keep and bear arms. – Signs, lots of signs! Focus on the Second Amendment, gun safety, and how many gun control laws turn law abiding citizens into criminals. This is not an open carry protest, but you can open carry if you’d like. Open carry is legal in Longmont! Firearms must be holstered or slung and should be secured; and if concealed, properly permitted. If you need an address for GPS reasons, use 600 Main St., Longmont CO 80501. This is the address of a gas station on one of the corners. Please line only the west side of Main St. We do not want to block any businesses, and please do not park behind Pumphouse Brewery so we don’t take up customer parking.